Forty years ago, I left my small town of Lowville, NY, wide-eyed and, let’s be honest, completely unprepared for the adventure that lay ahead of me. I was on my way to Ohio Northern University, registered as a painting major getting a teaching degree. Two years in, I had a strong desire to get my own apartment so I could set up a private studio where I could work day or night. Special permission was required to make this happen -- and it was special permission I couldn’t get. Being the tenacious young adult I was -- led almost entirely by my gut and my heart -- I made a bold decision: I quit ONU and began to explore other options. I stuck out the rest of the year to get my associate’s degree, then rented a U-Haul and moved home. My college journey wouldn’t end there, though. After a couple months of bartending (yes, really), I was able to realize that I needed to continue on with my education with a gentle nudge from my mother. I soon had an interview at Rochester Institute of Technology. At the time, there were no openings as a painting major, but my interviewer recognized that my work had a high level of design, so they offered me a spot in their graphic design program. The fork in the road had appeared -- and as much as I yearned to build a life around painting, I accepted the path that diverted me from it. Design had promises painting couldn’t make at the time: More opportunities. Better pay. And a program that was ready for me right away. It led to my career as a corporate-level graphic designer -- a career that saw me through two children -- and a career that gave me the experience I needed to eventually launch my solo design business, which I still work in and on each and every day, 20 years later. In hindsight, it’s easy to see that my path diverted from my dreams. Did I sometimes wish things had gone differently? Of course. Am I grateful for the experiences I’ve had? Absolutely. Here’s the thing: Though my time spent painting has waxed and waned throughout the years, I’ve never entirely let it go. There have been patches where the canvas became foreign to me and I let other priorities take precedence, but persistence brought me back. Making time to paint while raising kids, nurturing a marriage, and growing first a career and then a business, certainly wasn’t always easy. But I knew it as my release, and as hard as it sometimes was (and is, still), I persisted. I now paint weekly, if not daily. I’ve built a beautiful portfolio I’m proud of. I’ve painted in competitions. And I’ve met amazing painters who’ve shown me that a life of painting is entirely possible in a way it might not have been as that wide-eyed 18-year old with a brush and an easel. In fact, the gallery where I paint each and every Wednesday night is the same gallery that brought my path full circle when they asked me to teach a class. Forty years after embarking upon a teaching degree, I’d become a teacher. And I’m more ready for it than ever. Had I not kept going; had I not let the path unfold before me and let lessons appear as they were supposed to; had I not continued to paint through it all...I may not have come to this place I am now: Fulfilled, yet still wide-eyed and curious. Plan as we might, we can hardly ever truly know what the future holds. 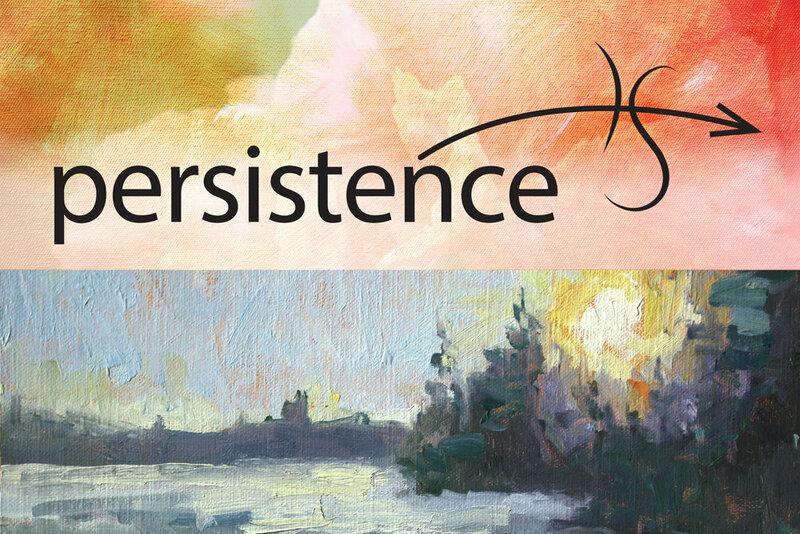 It’s persistence through it all that helps us discover and define our journey and, eventually, our legacy. The greatest leaps don’t happen overnight. As boring as it may seem, they happen as the culmination of persistent daily actions -- even if you can’t always see the outcome. Whatever it is you’re working toward -- whether it’s been a lifelong pursuit or is a brand new endeavor, I urge you to practice persistence on your path to get there -- and gratitude for the lessons that will eventually make themselves apparent. Know this: As long as you keep moving, you’ll find your way. P.S. As it turns out, teaching is a phenomenal way to stay curious.